BANK customers are falling foul of a new scam and these experts gave a great insight into ATM fraud and how to avoid being the next victim. Finding out that your bank card details have been accessed and your money has been stolen is a nightmare situation that most of us want to avoid. Barclays' Lynsey Haggarty shared this video from a Friends against Scams event at Gogarburn in Scotland on her Facebook, warning the public about some of the scams fraudsters are using to try to swindle our cash. An expert explained it can be hard to detect whether an ATM has been tampered with but urged people to be vigilant. He said: "This ATM has two devices on it but by just looking at it you would never know they were there, it's important to check the ATM before you put your card in." He warned against false faces that are put on ATMs simply with sticky tape, containing devices to read and process card details. He also suggests that people keep their pin number covered. "These devices might contain a camera, which can be seen through a pin hole. "If you see a pinhole all you need to do is protect yourself is to cover up your pin number with your hand. "If you do notice a device do not touch them, go somewhere safe and call 999," he advised. He also advised that there are new devices which trap your card and can be released by those who installed them. 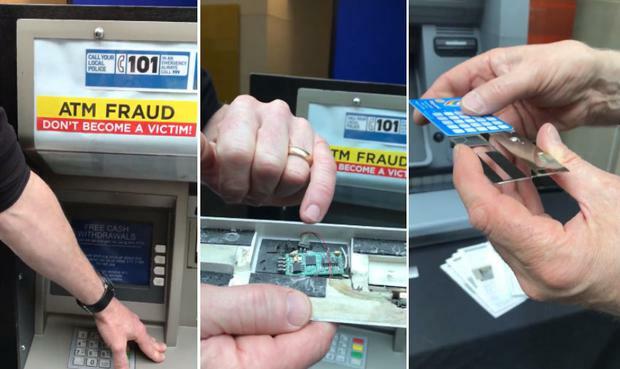 He said: "If your card gets jammed in the machine make sure you cancel it, if they've made one of these devices they've probably made loads of them." Charlie Weston Claims vulture funds engage better with borrowers in arrears than banks are set to be dismissed as "fairy tales". Charlie Weston The cuckoo is a summer visitor to Ireland. It mainly eats caterpillars and other insects.